The Science Council is pleased to announce that the Association for Simulated Practice in Healthcare has been welcomed as a full member organisation. This was ratified at the General Meeting held on 13 October 2016. The Association is dedicated to improving patient care and professional performance by the use of simulated practice and technology enhanced learning. The Association represents scientists and technicians across healthcare, education and in patient safety arenas. Until now scientists and technicians working in simulated healthcare have not been recognised for the vital skills they bring to their profession. Science Council membership will help ASPiH’s raise the professional status of its members and, through professional registration, provide career development opportunities that professional registration can provide. The Association will be working towards offering Science Council registration to their members, through co-licensing with our existing Licensed Bodies. 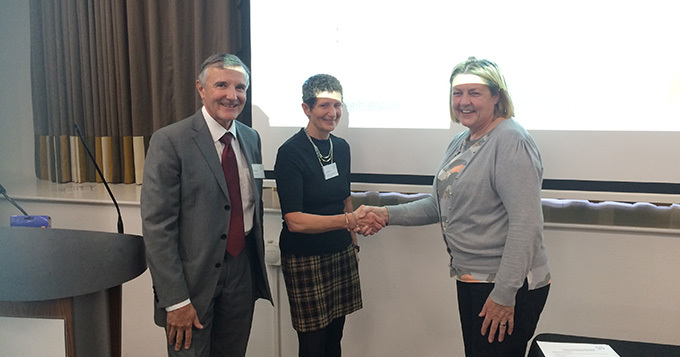 Photo: Jane Nicklin, ASPiH Executive Committee Member with Dr Heather Barrett-Mold, Science Council Chair and Dr Colin Grant, Chair of the Registration Authority.